I have read Amity & Sorrow in April 2013, so more than two years ago, and I am still, to this day, haunted by it. This incredibly vivid and emotional tale imprinted itself on my memory. I still remember how I felt while reading it - scared, moved, worried and, above all, fascinated and frustrated. This book took me way outside of my comfort zone and it was one incredibly powerful and enlightening experience for me as a reader and as a human being. The story revolves around some truly difficult and serious subjects and it explores themes that are more than just disturbing to read about. And yet, the author navigates these themes so swiftly and with so much conviction, you can't help being mesmerized. 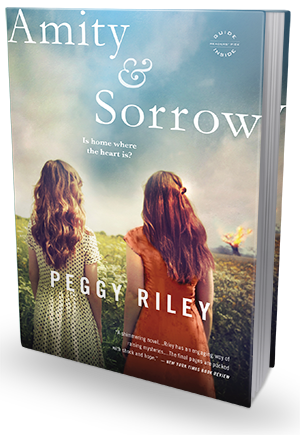 Amity & Sorrow tells a sad and harrowing tale of a mother and her two daughters running away from a polygamous compound. Amity and Sorrow are the names of the two teenage girls who have never left the compound before and all they know is what they've witnessed and been taught within its walls. Their mother makes the decision to run away from that place, and we only later on find out why. It's not an easy decision to make for her, not by a long shot. She is escaping from her own husband who happens to be the leader of the cult. She drives for days without sleep, until finally the exhaustion takes over and she crashes the car in rural Oklahoma. There, they meet a local farmer, Bradley, who is dealing with his own demons. An unlikely friendship sprouts between them - strained and unwanted at first, but ultimately healing and desperately needed. Until their past catches up with them and refuses to let go again. This book is about so many things, but most of all it's about sacrifice, redemption, weakness and finding strength to break away. It's about the poisonous religious cults, sexual abuse disguised as devotion, misplaced trust and starting from scratch, no matter how scary or painful or impossible-seeming it might be. Once again I find myself wishing there was a *DISLIKE* button on Goodreads "reviews". How incredibly closed-minded and ignorant some of these "reviewers" can be. Case in point: A girl picks up a book depicting the reality of a religious cult and gives it a one-star rating based on the fact that it doesn't have STRONG and INTELLIGENT female characters. It's like deciding to read Twilight and complaining that it isn't about faeries. First of all: THINK for a moment. Religious cults prey on weak and emotionally damaged people with diminished intellectual abilities. People who are scared, often paranoid, unable to function on their own. These people join the cult because they desperately seek validation, security, protection, and the feeling of belonging somewhere. They want their lives to be meaningful (i.e. they want to serve God and lead an idealistic life). These people are like children - they are dependent on the leader and believe in everything he says. How can you expect those people to be intelligent and strong. They wouldn't be in the cult in the first place! Second of all: I hate people who bash books just because they don't like the idea behind them. I don't like cults either. They horrify me and I could never relate to people who make a concious decision to join one. But that doesn't mean I don't appreciate a well written issue book, no matter how frustrating and appalling the subject matter. In a similar way, I appreciate other issue-driven books (bullying, homophobia, alcoholism, etc), but that doesn't mean I necessarily "enjoy" the issues depicted in them. Dear GR "reviewer", please grow a brain. And learn to use it. You're at risk of becoming a cult member yourself. So yeah, there you have it. I'm not proud of it. OK, maybe I am (just a tiny bit). Anyway, my point is, not many books can get me so riled up, I actually go venting around. I enjoy books illuminating controversial subjects and taboo topics, but I don't usually go all ballistic on people if they don't agree with my personal opinion. I do feel kind of bad, but hey, for the sake of honesty, I'm putting it all out there for you today.